There are few holidays as playful as Halloween, and we like to extend that attitude to the vittles we serve our little goblins, princesses, and aliens. We also believe Halloween treats don't have to be laden with sugar and artificial ingredients. With just a little creativity and some kid-friendly fruits, you can make healthy Halloween snacks, appetizers, and desserts that will win you giggles as well as applause. Read on for 5 frightful fruit treats that you can make for or with your kids. Bananas are definitely a favorite kids’ fruit, and these little ghosts are simple enough for your youngest sous chefs to create. Simply peel a banana and cut it in half. Add chocolate or carob chip eyes and a mouth. You can use the same size chips for the eyes and the mouth or use mini chocolate chips for the eyes. Stand up the ghosts on a plate and serve. Assure your little ones that choosing this crunchy, healthy snack instead of sugary candy will prevent them from having mouths and teeth that look like these! Cut wedges from an apple. Leaving “lips,” carefully cut into the skin of the apple, making sure not to pierce through the whole wedge. Cut out the mouth and remove the apple skin and flesh. Use a knife or toothpick to make small holes in the open mouth, then add slices or shards of almond (I blanched and peeled mine first). 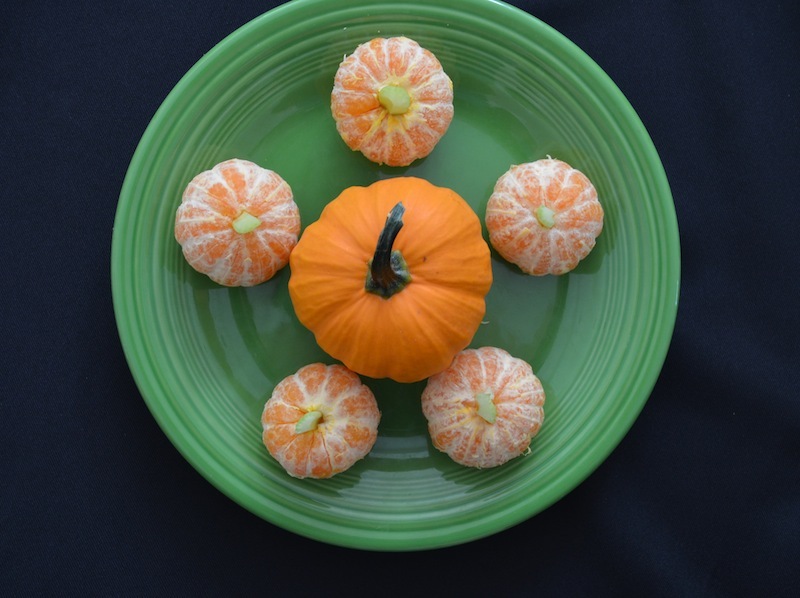 Another easy and very visually appealing Halloween treat that’s so cute, it could be a centerpiece! Peel several clementines. Press a small piece of celery into the top to act as the pumpkin stem. You could also try using oranges and making a pumpkin patch with both sizes. 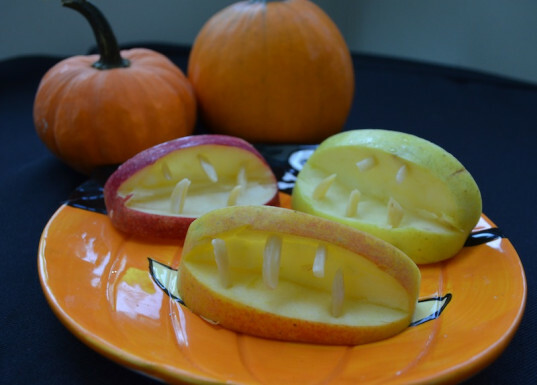 This Halloween snack is a fun little project for the family to partake in. Use a fruit with easy-to-pierce skin (like a plum) for the body. 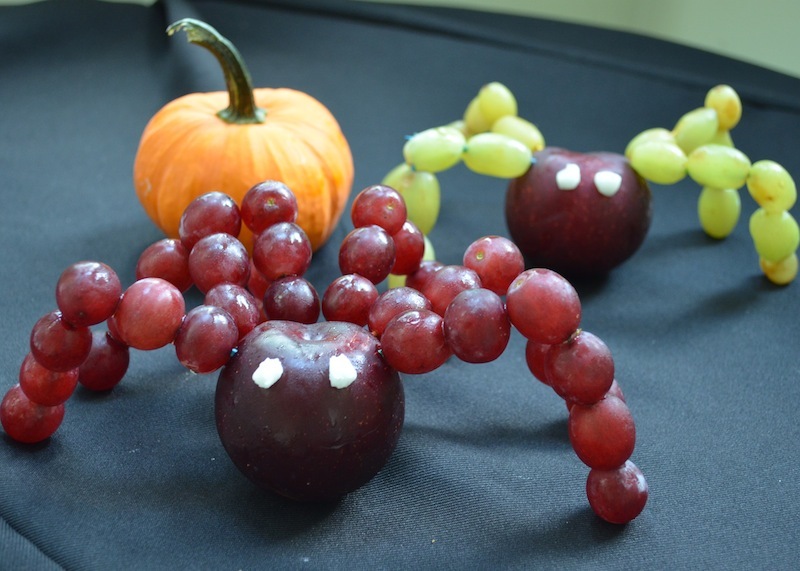 To make the legs, poke a toothpick or a pretzel stick into the top side of the fruit and add a few grapes. Take another toothpick or pretzel stick and add several more grapes to it, leaving a little space at the end. Use the exposed end and attach it to the last grape on the already-attached leg part. Repeat for as many legs as you want. I had some leftover frosting so I used that to make eyeballs. You could also use marshmallows or pieces of dried fruit, such as apricot or raisins. The insides of this fruit (often thought off as a veggie) are a wonderful, ghoulish green and packed with lots of healthy fats and nutrients. 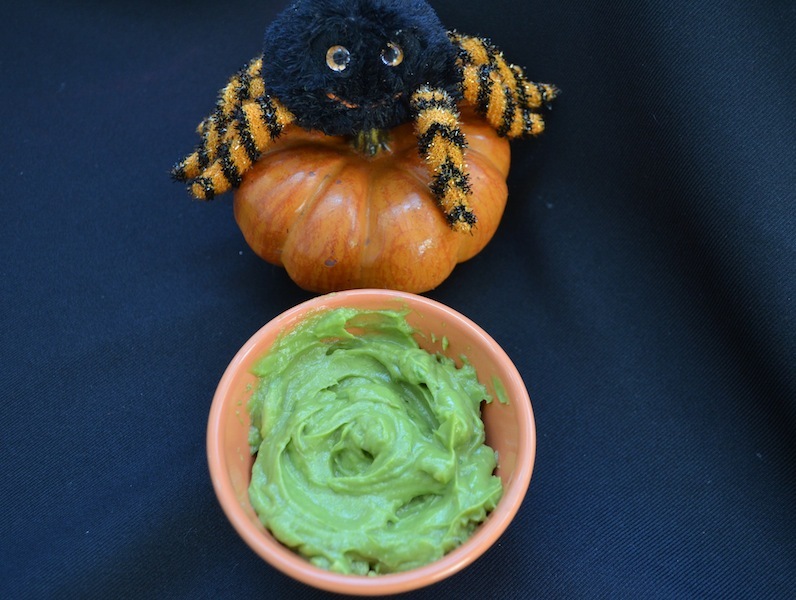 We have used it to make this super tasty raw pudding, but we created an even simpler recipe for Halloween which allows the dish to retain its vibrant color. In a food processor, blend an avocado or two with several teaspoons of agave or honey and a pinch of sea salt until the mixture is well-combined and fluffy. Spoon into a serving dish and serve immediately. 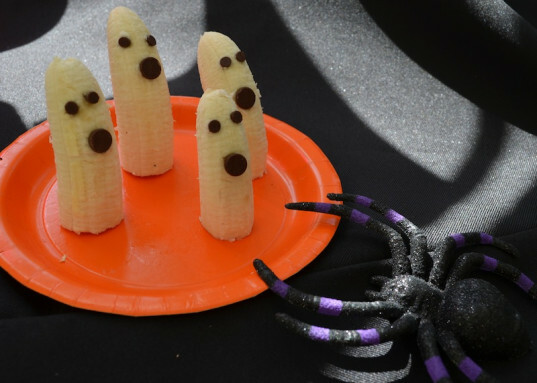 Bananas are definitely a favorite kids' fruit, and these little ghosts are simple enough for your youngest sous chefs to create. Simply peel a banana and cut it in half. Add chocolate or carob chip eyes and a mouth. You can use the same size chips for the eyes and the mouth or use mini chocolate chips for the eyes. Stand up the ghosts on a plate and serve. Assure your little ones that choosing this crunchy, healthy snack instead of sugary candy will prevent them from having mouths and teeth that look like these! Cut wedges from an apple. Leaving "lips," carefully cut into the skin of the apple, making sure not to pierce through the whole wedge. Cut out the mouth and remove the apple skin and flesh. Use a knife or toothpick to make small holes in the open mouth, then add slices or shards of almond (I blanched and peeled mine first). 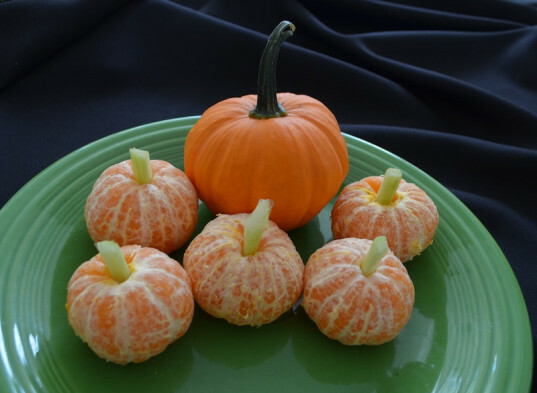 Another easy and very visually appealing Halloween treat that's so cute, it could be a centerpiece! Peel several clementines. Press a small piece of celery into the top to act as the pumpkin stem. You could also try using oranges and making a pumpkin patch with both sizes.